The Starter Edition of the award-winning Crystal Reports Scheduler, CRD, from ChristianSteven. Schedule single or batches of Crystal Reports. Export to pdf, rpt, csv, html, xls, doc, rtf, txt & xml. Deliver via email (SMTP & Exchange), printer, disk folders or by fax. Reliable, intuitive and great value for money. Works with Crystal 8.5, 9, 10, 11 (XI) and 12 (2008). Includes 12 months updates and support. Schedule single or batches of Crystal Reports. Multiple formats & destinations. - Installs on 32-bit & 64-bit versions of Windows XP, Vista, Windows 7, Server 2003 & Server 2008. - Includes 12 months updates and support. - Reliable, intuitive and great value for money. CRD is a Crystal Reports Scheduler that saves time and money by making it easy to automate Crystal reports. Simply define single or packages of Crystal Reports, schedule and run them automatically, and send the reports to print, fax, disk, ftp, sms or email in a number of standard formats. You can just "set it and forget it". Simply set up a schedule stating how often you would like each report to run, whether you'd like the output in Word, Excel, HTML, RTF, Acrobat, RPT, text format, and more and who it should be sent to. 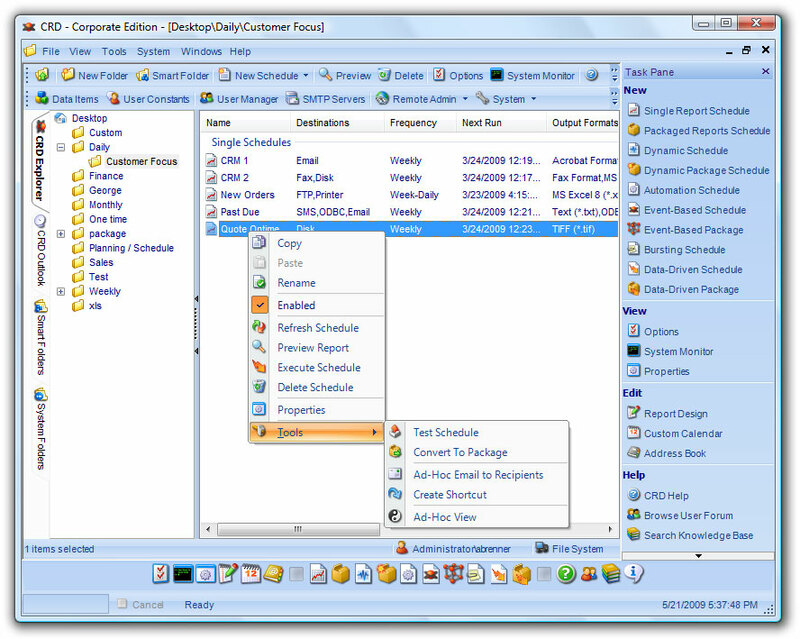 The Crystal Reports Scheduler , CRD, will do the automated delivery for you! Qweas is providing links to CRD Starter Edition 7.0.110529 as a courtesy, and makes no representations regarding CRD Starter Edition or any other applications or any information related thereto. Any questions, complaints or claims regarding this application CRD Starter Edition 7.0.110529 must be directed to the appropriate software vendor. You may click the publisher link of CRD Starter Edition on the top of this page to get more details about the vendor.